Have a whale of a good time with this creation! Big wide moving mouth, great to use to tell the story of Jonah in the whale. Talk about the one that got away! Or have the fish make fun of the fisherman. Many possibilities! Just thought it looked fun! Measures 16" long. Easy one hand operation with push button control (see pictures) for big wide mouth! Here's one you won't find just anywhere! Odd, different, okay - a little crazy! Raising eyes and moving mouth. 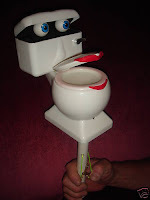 You can operate him from within a box so controls are concealed or out of the box so controls are in plain view, doesn't matter - he's a toilet. Sometimes he fills a little "flushed". Things get "backed up" in his life. Do you get "clogged" down with problems? This guy knows what you mean. Easy one hand operation, two controls one for his mouth (index finger) and one for his eyes (thumb) Who left the lid up!? 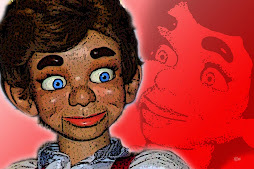 Great for all ventriloquists beginner or pro! The three DVD's below feature the family ministry of Kevin and Sonja Detweiler. A completely different program is on each DVD, taped live on location. Fun-filled, fast paced programs featuring ventriloquism, gospel illusions, audience participation, and more! 10-12 different bits on each program! View as one program or view in segments. Produced in 1999, these programs as as entertaining and instructional today as the day they were produced. These DVD's were produced for viewing at home, in the classroom, at kid's club, youth meeting, etc. They are also a tremendous resource for any teacher or children's worker! (You are welcome to use any of the ideas/lessons presented on the "Detweiler's Live" DVDs. ) Running time 52-55 minutes per DVD. $10.00 each, or $25.00 for the set of 3.
Who Has Your Heart? What makes a champion? Who is your hero? The viewer is challenged to answer these questions from heaven's point of view. Who Is In Control? How can I make the right choices? Which voices should be listened to? How to make solid, life-changing choices from a Biblical perspective. Making The Right Move. Excuses - so easy to make, but what about the consequences? The danger of thoughtless words, careless delays, and postponing important decisions. New items will be added periodically to this page. Daily Ventriloquist blog on a regular basis?